Thank you to everyone who voted for us in Foodbuzz’ Project Food Blog to get us to this round. A new voting session begins October 4th-7th and you can go HERE to place your new vote. 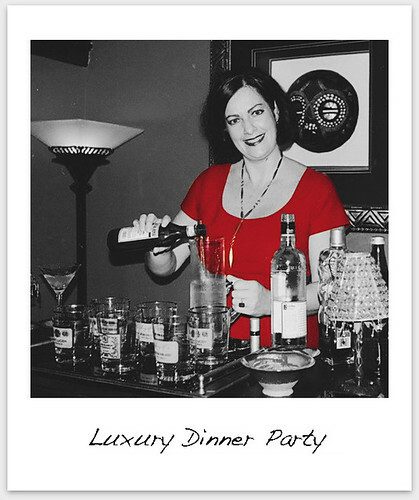 There’s nothing I love to do more than plan and execute the classic dinner party. The planning usually begins with some sort of inspiration, be it an occasion, a menu bursting to get out, friends who might be in town for a short while, a new kitchen gadget that just has to be used, creativity just waiting for an outlet, the change of seasons. 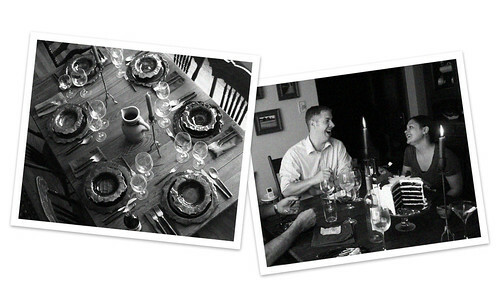 So many things inspire dinner parties, and that’s the reason I have them often. For this dinner party, the inspiration came from Buick LaCrosse who is sponsoring FOODBUZZ’ Project Food Blog competition. In anticipation of advancing to this round, last weekend I invited some friends over for a mid-week “Luxury Dinner Party” and planned a menu featuring this season’s treasures. Even though this was on such short notice and it landed mid-week the small group I invited were ecstatic. One put it this way: “Let’s face it Katy, any time you ask us to dinner without the kids, it’s a luxury dinner party.” What great friends I have! Here’s the menu, some of the items you can click on to be taken to their recipe. We promise to post recipes for the other items soon. I suppose everyone has their secrets to throwing a smashing shindig of a dinner party, and I’m not different, there. In fact, the following tips are what enabled me to throw one on such short notice. Don’t get me wrong, I did have to hustle and whiz through a lot of them at warp speed to make it happen, but in the end I threw on my red dress and proceeded to have a stellar time. Now I’m pooped! Clean your house. This can be done days and days ahead of time, and having regular dinner parties is a great way to make sure you keep your house clean from top to bottom. I do this even when I’m not entertaining my gay boyfriends. This is probably due to the fact that I’m a gay man trapped inside a woman’s body, but I digress. Send invitations out 2-3 weeks in advance. You may do this using evite or with traditional, paper invitations sent via snail mail. Plan your menu far ahead of time. Have fun with it! (That’s an order!) Make lists of what you’ll need and where you can get the best quality products. Pick up non-perishable ingredients a week before and fresh ingredients the day before or the day of the party. Set your table the day before the party. This gives you time to make sure all is in order and to add anything that might inspire you. Our Great Aunt Jo used to do this when she’d serve (read: have catered) fancy schmancy lunches, even for just 3 or 4 people. Her table was always beautiful. 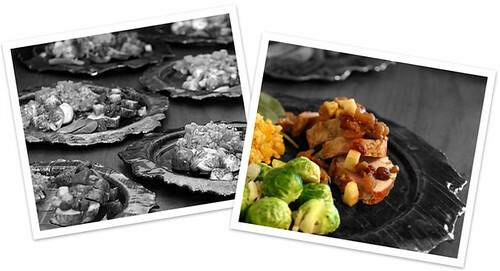 Start making your food the day before the party so that you have less slicing and dicing to do the day of the party. 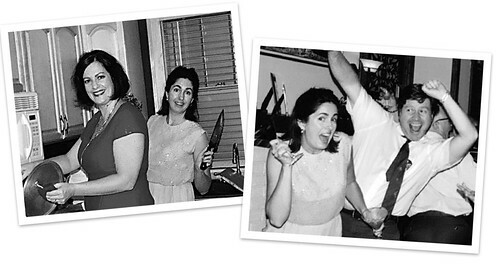 When we had parties for hundreds of people, Patty (Mom) would have us all in the kitchen the night before, making (and, of course, drinking) sangria and prepping the foods. Someday we’ll have to tell you the story of the time Patty imbibed a bit too much. It’s a classic. Also, when planning your menu, place an item or two in it that can be made in advance. Often for me these are the soup course and the dessert course. For this party, the cake layers were made last weekend and frozen. I frosted the cake the day before the party. I also made the salad dressing a couple of days before the party and stacked the salad early the morning of the party. Get yourself ready long before all of the last-minute preparations. Hours before, preferably. I will often be working in my underwear and an apron, or, most likely my slippers and some sweats, until about an hour before the party begins. Pick your music out early in the week, and press “play” about 30-45 minutes before guests arrive as you’re chilling a cocktail. You want to enjoy yourself and be relaxed when they arrive so they can do the same. There is nothing more off-putting than running around like a chicken with your head cut off (except having an actual chicken with its head cut off running around). Sip your cocktail as you finish readying yourself. I like to apply makeup and don my clean, pressed dress/outfit/fab ensemble at this time. Light candles 5 minutes before guests arrive, as you sip your cocktail, Don Draper style, just before taking appetizers out of the oven or refrigerator. If a guest arrives early and asks what they can do to help, have them light the candles then ask if they’ll play bartender (if you know they’re good at it, which many of my friends are) when your other guests arrive. The main thing is to have a wonderful time with your friends. So, luxury or not, clean or not-so-tidy, have people over and break bread with friends new and old, regardless. You’ll all be so glad you did! look at you! All classy and Don Draper like!!! Oh my word. I totally would come to this party! Great post! Looks like so much fun! Good luck, I just voted for you! Great comments and recipes! Can’t wait to try some of them. The menu and food looks amazing. And, as my eyes landed at the end…Oh my goodness – the name alone makes my mouth water…CHOCOLATE CAKE BOMB? Wow, I want some! I really enjoyed this post and I really really like the approach you took with your images – love the black an white with touch of color – gorgeous! I am definitely voting! What a fun post! Chicken with head cut off gave me a good chuckle. 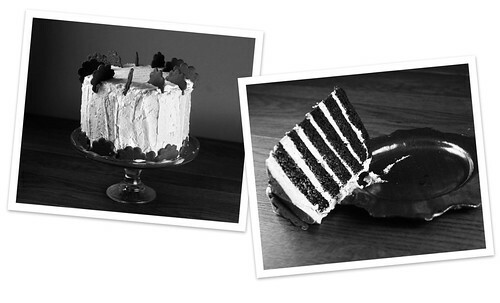 Love your photos, especially the black and whites! I loved your party tips! Setting the table the day before is such a good idea! this is awesome! love the way your pictures came out here, wonderful job lots of luck in this competition your doing a fabulous job! I love it! I almost used some vintage photos in my entry. Going to vote now! Fantastic! I loved this post. I wanna come to dinner. You know you got my vote! Those photos are priceless. I hope you know this post makes you sound like super woman! I have never been that organized in my life! Way to go:-) I feel like freezing cake layers right now just in case but I’d probably pull them out tomorrow afternoon while my kids are napping and devour them. Oh well! You’ve got my vote! And thanks for the foodbuzz comment – I don’t twitter cause as a mom I can only be so cool. I figured out facebook and that’s enough for now! what fun photos. I like the B&W vs. color contrast! Looks like a spectacular time…love the menu, too. Voted! Ok am I crazy or do you have an awesome 50s theme grove going on here? Nice diner and you have my vote. Hope I have yours too! This is fantastic! For sure you are a gay man trapped in a woman’s body! We sometimes laugh at church with a gay couple who insist that the worst dinner parties are thrown by lesbians. Who says sloppy joes and beer don’t constitute a dinner party?! OK – had to laugh at the clean the house in advance remark because with 2 kids under age 5, well I have to clean right up until guests arrive and even around the guests as they stand there and the kids whizz past them knocking things over! 😉 Can’t wait for your amazing-sounding chocolate cake recipe! Great tips and I LOVE your pics! You’ve got my vote!